"The industries best solution to blind nailing close to the wall. Save both, time and money!" Pressure activated...simply press down, and let the tool do the work. The Power Palm will allow blind nailing closer to the wall and reduce the amount of face nailing. 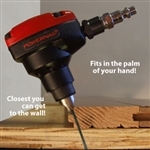 "Using the Power Palm with Powernail 16 or 18 gauge L Cleats you will maintain the integrity of your installation, by using the same fastener from start to finish"
"Blind nail, top nail...tight spots and corners, the Power palm gets them all!" The POWERJACK® Model 500 combines the best features of the Model 100 and 200 into one versatile tool. PowerJacks are designed to pull or push tongue & groove flooring strips into place and hold them tightly for hands-free nailing. Powerjacks will work on almost any thickness flooring without damaging the flooring surface. They can be used next to the wall, at stud locations or anywhere else on the floor. The Model 445 FLEX Power Roller uses 16 gauge Powercleats® nails (.062") which come in lengths of 2", 1 3/4" and 1-1/2". Nailer package includes a choice of Black or White 3mi Mallet, lube oil, 2 box wrenches, 2 Allen wrenches, and an extra driving blade. (L/L, S/L, S/S, XL/L & XL/S) when ordering at no additional charge. The Powernail FLEX with Power Roller is truly flexible nailer. The FLEX is designed for 18 gauge cleats and can nail down a wide variety of tongue and groove flooring found in today's market. Using the adjustable foot of the Powernail FLEX, you can fine-tune the nailer height according to different wood profiles. No need for extra shims and pads! The Powernail Flex is recommended for use on 3/8", 1/2" and 5/8" Tongue and Groove flooring as well as some 3/4" exotics, bamboo, engineered and other solid wood flooring. The Powernail Flex uses an 18 gauge cleat that is less likely to split the tongue on denser, more brittle woods. It is also recommended for flooring that is a very hard species like hickory. Many of the hard exotics available today require a thinner cleat to penetrate without splitting the tongue. The standard configuration is (L/S), Long Handle with Short Channel, which holds 100 Powercleats®. Long handle configuration provides 18" height from floor to handle grip. Nailer package includes a White 3mi Mallet, 2 Allen wrenches, user manual, lube oil, extra driving blade and 2 box wrenches. Requires a 70 to 110 psi air compressor. The Powernail Model 445FS POWER ROLLER is a mallet-actuated, pneumatic stapler and uses the same proven design that has made our nailers the standard of the commercial flooring industry for over 50 years. The 445FS FLEX Power Roller has an adjustable foot for installing 3/4" to 5/8" tongue and groove flooring without using adapter pads. The Model 445FS FLEX Power Roller uses 15.5 gauge PowerStaples® which come in lengths of 2", 1 3/4"
Standard configuration is a long handle with short channel. Stapler package includes a 3mi Mallet, lube oil, 2 Allen wrenches, 2 box wrenches, users manual, and an extra driving blade. Stapler ships with all urethane rubber tires installed to protect prefinished flooring.